The long pending demand of installation of the life size Bronze Sculpture of Bharat Ratna Dr.Babasaheb Ambedkar is getting towards fulfillment. 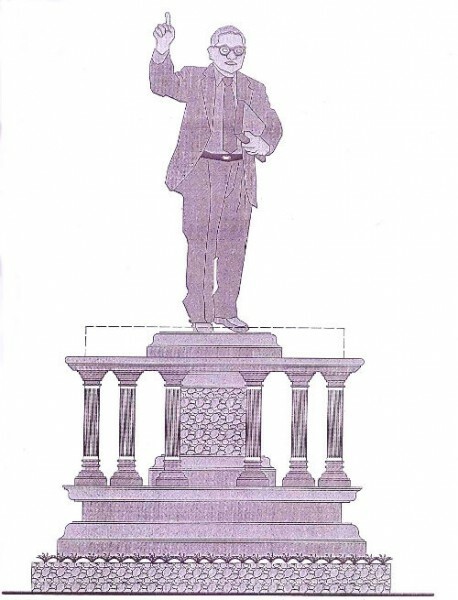 A 17 feet tall statute, tallest in south India would be adorning the the pedestal already built at the city Corporation office Belagavi. It may be recalled that at the maiden general body meeting of the Belgaum city corporation, it was unanimously decided to install a life-size statue of Bharat Ratna recipient Dr. B.R. Ambedkar in a mini-garden on the premises of the new building of the BCC. The estimated cost of the project is about 1.25 crores. Now the elected representatives are busy with whom to call for the inauguration. Some members want the CM Siddarramiah, Governor, some other want some other politicians and leaders and except the event to be celebrated with great fan fare. On 26 December 1939 Dr.Babasaheb Ambedkar visited Belgaum(now Belagavi) and in the Municipality then the First citizen Mr.Bhimrao Potdar honored Dr.Babasaheb Ambedkar with a Momento.